Featured What’s Up With DegrassiBlog.com? Maya’s opening plot of the season is lackluster. Clare delivers raw emotion in a storyline hinted at in season 12. The dynamic of Adam stuck between two girls makes for a fairly interesting storyline. In a rare yet well-done move, Degrassi examines Tristan’s character based on past negative experiences in regards to his sexuality. Clare’s cancer storyline stays strong as she attempts to do the same. Alli’s plot is neither good nor bad…it just sits there as bland episode filler. Clare’s plot continues to be the anchor that carries Degrassi Season 13. A lack of chemistry and interest transforms Alli’s plot from harmless filler to pointless plot. Tristan, Miles and Zoë make for the most interesting love triangle the show has seen in quite some time. Adam’s plot boasts relatable feelings and strong acting from Jordan Todosey. Degrassi’s “most interesting love triangle” transforms into a convoluted love square. Jenna and Connor are the only thing that make Alli’s plot in this episode worthwhile. Strong up-and-down feelings and a strong cliffhanger make Adam’s worth the watch. As the love square straightens out, we receive a cute storyline with Maya and Tristan. The injection of a creeper and Jonnor make this the type of interesting filler Alli/Leo can’t be on its own. Alli’s plot reaches its breaking point, but is still too weak to be the show’s main plot. An uneventful plot sets up an interesting feud between Maya and Zoë in the future. Luke Bilyk delivers one of his best acting performances in an emotional episode for his character. Degrassi delivers a wonderful, touching tribute to the life of Adam Torres. Drew’s mourning storyline gets off to a wonderful start. Alli’s “fairytale romance” with Leo improves upon the plot being moved from Paris. Degrassi finally gives us a decent, solo look at new girl Zoë Rivas. Drew’s inability to cope with Adam’s death is heartbreaking. Zoë’s plot simply lays down the foundation for her feud against Maya. Leo attempting to befriend Clare and Jenna is actually interesting. 1311 — You Oughta Know: B+ (Clare) | C+ (Tristan/Miles) | B+ (Imogen)Degrassi finally deals with post-cancer side effects, and weaves uncertainty into Clare’s future. Tristan is given another silly storyline in hopes of securing some form of a relationship. Imogen’s awkwardness drives an important plot point involving her summer fling with Adam. It has a strong antagonist (chemo brain), but Clare’s plot also drifts down a repetitive, silly path. Tristan and Miles’ plot reaches an extreme level of absurdity. Imogen bravely gives Becky and herself the closure they need in regards to Adam Torres. The Tenners finally deliver a strong, well-layered storyline in season 13. Degrassi gives us a rare treat by giving us a storyline to the more-than-capable Mike Dallas. As Alli attempts to balance her future and her relationship with Leo, their plot ends with an interesting, yet startling cliffhanger. Degrassi presents a moral dilemma as Maya seeks revenge against Zoë. The reasoning behind Dallas’ recent behavior is a wonderful surprise in terms of continuity. As heartbreaking as her disposition is, Alli continues to represent a storyline that’s far too common in real life. Drew’s plot has a good message, but takes an odd route to get there with over-the-top behavior by Winston. While Tristan is either hit or miss, he has a hit on his hands as the storyline focuses more on him and less on his personal relationships. Uncertainty of the situation is ultimately what drives Eclare in rare C-plot form. Drew’s worst fear finally comes true as Drianca reaches an emotional conclusion. Tristan is effective in this filler plot that attempts to wrap up Maya and Zoë’s feud for now. Eclare’s reunion feels too rushed, and needed more time than could be afforded in a C plot. Alli and Leo’s relationship finally reaches the breaking point with a chilling episode. Too many questions are left unanswered after Maya and Zig’s first interaction since season 12. Degrassi does a great job of continuously showing Drew’s insecurities. Alli’s long-running arch in season 13 ends on an strong and emotional note. The tenners improve as we see Maya struggle to gain acceptance. Drew’s insecurities to continue to be the focus, and they become more intriguing and complex with Zoë in the equation. Drew’s venture into an uneven relationship is fascinating. Imogen’s storyline brings up great points about today’s double standards toward women. Alli’s plot in this episode is little more than filler. Drew’s nasty breakup with Zoë brings about the best drama we’ve seen in season 13 so far. Degrassi teaches an important lesson through Imogen than actions speak louder than words. Dallas breathes life into Alli’s first plot in the post-Leo era. We receive a deeper look at Miles Hollingsworth, who’s more than just a trouble rich kid. It’s unsettling that Clare’s feelings for Drew seem to come out of nowhere. Bhandallas is thankfully put on hold as Alli makes a bold confession. Miles is set straight after a much-needed reality check. The fact Clare must hide her feelings for Drew from him as well as Eli make for an interesting angle. In a wonderful scene, Alli finally receives the closure she needs. Degrassi delivers an honest, powerful episode that covers multiple angles of sexual assault. Maya nobly steps in to help a friend when no one else will. Jenna and Connor are the most interesting couple on Degrassi to watch. Becky’s storyline wonderfully illustrates jealousy within a friendship. Tension runs high in this bearable love triangle. Jenna and Connor deliver a very simple, yet refreshing storyline about self confidence. Degrassi doesn’t jump the shark by pairing Becky with Imogen. 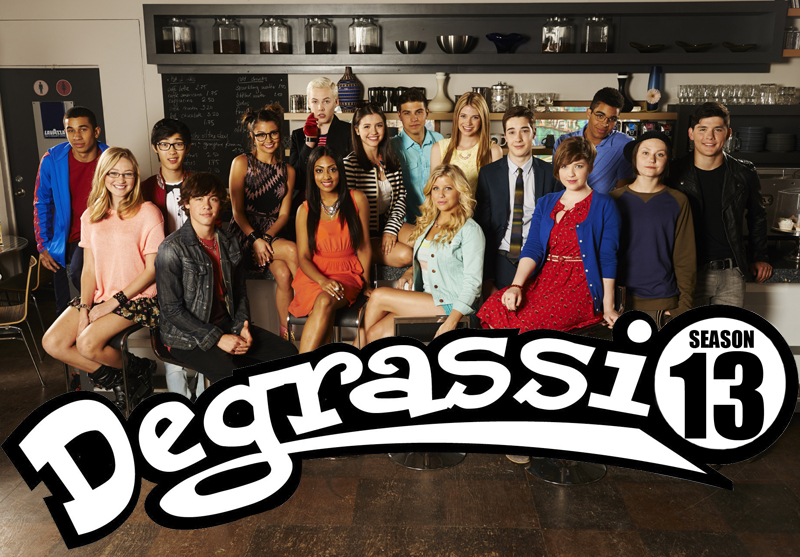 Dallas delivers a strong storyline in a rarely touched upon topic on Degrassi. Clare’s emotions have her behaving all over the place when it comes to Drew. Degrassi is laying down the foundation for an intriguing student-teacher relationship storyline. Dallas continues to carry his own with another strong episode about race. A heartfelt conversation between Clare and Drew about their feelings makes up for the weirdness in Army Of Me. Tristan’s storyline is exciting knowing how naive he is about love. Maya’s emotions drives an intense storyline about a “love triangle” that’s more about love and less about romance. Clare’s romantic storylines have been hit or miss in season 13; this is yet another miss. Zoë becomes vulnerable in her first plot since being sexually assaulted. Maya’s heart is in the right place in this solid friendship plot. Frankie and Winston deliver a cute filler relationship plot. Clare finally moves on from her romantic interests the right way. Maya stands firm in her commitment to help her friend. Winston’s plot is simply filler in this episode. Clare’s plot is at its best when we get to the heart of her feelings of rejection. Drew finds himself learning that sometimes the truth hurts. Becky’s plot is relatable as she finds herself looking for a distraction from real life. We finally start seeing Zig’s storyline from his perspective, and it doesn’t disappoint. In a rare moment, Drew Torres makes a smart decision. Becky faces the reality that you can’t always avoid reality. Zig takes advantage of an opportunity to prove himself and mend fences with his family. Tristan’s relationship with Yates is brilliantly disturbing. Imogen shows us how the need to impress others can affect our judgment. Frankie’s self esteem takes a hit at the expense of her friends. The Tristan/Yates storyline delivers excellent acting and emotion in one of this season’s best storylines. It’s interesting watching Imogen lose herself while trying to win Jack. Frankie and Winston are once again adorable as share a heartwarming moment. Both Ana Golja and Sarah Fisher give fantastic performances in an emotionally-gripping episode. Degrassi builds an unnecessarily complex storyline to pair up Drew and Becky. At long last, Maya and Zoë final come together to solve their differences. Miles and Tristan make a unique pairing that finds comfort in one another. Clare and Eli’s reunion feels genuine; the bombshell however? The jury is still out on that one. Mayas plot in Summetime – for the Tristan/Zoe jealousy component and her fight with her mom. I felt that this plot had great throwbacks to classic degrassi moments. We need to see more of Jenna Middleton! How can I make this happen! ?